Over the Easter Bank Holiday weekend Wolverhampton Halfpenny Green airport hosted "Wings, Wheels and Rotors 2014", a small fly-in style event organised for the last five years by Vaughan Meers and Alec Brew, and this year ably assisted by the ex-Kemble events team, with the aim of raising funds for a newly-formed transport museum in Wolverhampton - the Tettenhall Transport Heritage Centre. Tim Croton was at Halfpenny looking to exercise an itchy shutter finger. A former RAF station which officially opened in 1941, the airfield was originally named RAF Bobbington due to the proximity of the nearby village, situated in South Staffordshire close to the western border of Shropshire. It wasn't until 1943, after concerns were raised regarding the possible confusion with RAF Bovington just south of Hemel Hempstead, that the name Halfpenny Green was introduced. During the war, along with many other training bases in the Midland Counties, RAF Halfpenny Green was used for navigational and observer instruction; at one point having an impressive fleet of Avro Ansons on strength which replaced the somewhat inefficient Blackburn Bothas of the day. There are still substantial traces of the building infrastructure associated with its wartime past. So back to the present, as a General Aviation and Business Airport Halfpenny Green hosts a series of small events throughout the year. The first being the annual Wings, Wheels and Rotors, which is traditionally held on the Sunday and Monday of the Easter Bank Holiday weekend. The main aviation activity during the event centres on private aircraft flying in from all parts of the UK and on this occasion a visitor from Belgium, and as such is these are events that are very much weather dependant with regards to what actually shows up. Unfortunately, the Bank Holiday Monday weather was not ideal for the event with hazy skies the order of the day and the looming threat of rain being forecast for later in the afternoon, which fortunately didn't materialise. Despite the uncertainty over the weather, the event managed to attract hundreds of people to attend. Upon entering, the main concourse had a gathering of ex-military vehicles with associated weaponry on display, along with a dozen or so stalls dotted in and around the original Bellman Hangars. The inclusion of a couple of very loud static aircraft piston engines which were fired up periodically throughout the day didn't help sales for the nearby ice-cream van! 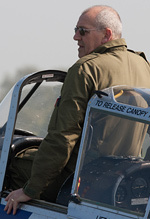 The occasion itself had a very relaxed and friendly atmosphere which is in-keeping with these types of relatively small scale events and not too dissimilar from the ambience of Old Warden and past Kemble shows to name but two. The WWII control tower (which, incidentally, has an excellent cafe on the first floor!) offered a good vantage point from which to view the runway activity. 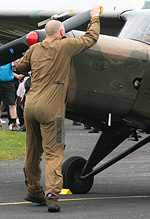 The aircraft movements were interspersed with flying displays of radio controlled models which entertained the public in between arrivals and departures. The Coventry based Classic Flight Dragon Rapide which was billed to give pleasure flights over The Severn Valley Railway was a no-show, so the Austin Aviation Robinson R22 chopper (based at Halfpenny Green) filled in to provide air experience for interested members of the public. The pick of the aircraft arrivals included of a lovely Army Auster in camouflage which was later joined by a two ship of ex-RAF Scottish Aviation Bulldogs. 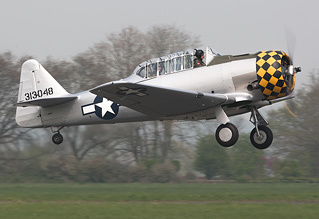 A solitary T-6 Texan G-TDJN piloted by Dave Nock was on the ground, departing mid-afternoon; Dave followed up with a spirited fly past. 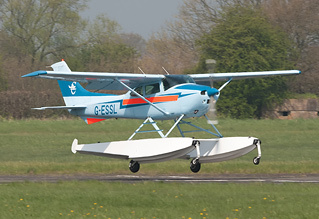 Another interesting aircraft that arrived and a first for the event was the Cessna 182R Seaplane G-ESSL, flown by John Russell. I did wonder how it was going to land with floats, but fortunately it had a cunning but effective undercarriage arrangement! Tony De Bruyn roared in with his SIAI-Marchetti SF.260 from Belgium via Rochester and completed a couple of very fast circuits on departure. However the highlight was the totally unexpected arrival of the Sud Aviation SE3130 Alouette II. Built in 1963 and carrying the civil UK registration of G-BVSD, this aircraft has been restored to it's original Swiss Army garb and it proved to be a very welcome addition on the day, expertly flown in by Mike Cuttell. Plenty of other aircraft came and went during the day and with special note the 1966 vintage Piper Cherokee G-ATYS was flown by Andy Hardy, who last year completed the 10,500 NM trip from London to Sydney, Australia to raise money for the Oxfam Charity. Overall, a very enjoyable few hours spent. I suspect the absence of the pair of Yak-52s was weather-related, which was a very slightly disappointing note to an otherwise fantastic day as I love to hear the somewhat "agricultural" sound of those Vedeyenev 9 cylinder radial engines. The organising team should be pleased with their efforts and hopefully the event will go from strength to strength as it's a real pity that there aren't more like it in the Midlands at present. Bring on a Warbird fly-in!